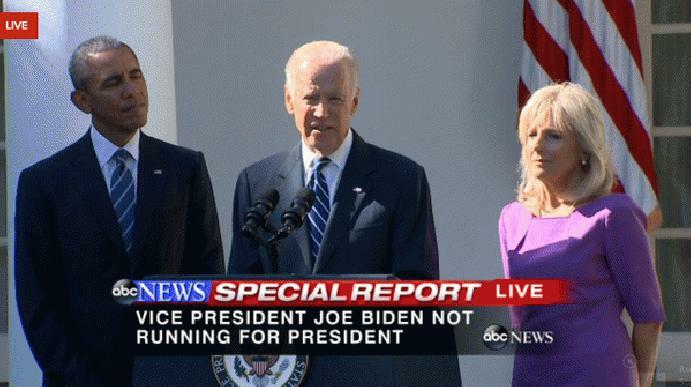 Joe Biden has announced he will not run for president, saying he no longer has the time to mount a campaign, and then proceeded to give what sounded like his campaign speech. I wonder if he wrote this speech before deciding, figuring he could use most of it regardless of his decision. Mr. Biden seemed to chide Mrs. Clinton for distancing herself from Mr. Obama lately, as she has done on trade, Syria, Arctic drilling and other issues. “Democrats should not only defend this record and protect this record, they should run on the record,” he said. While Biden declined to run in the primaries, it was clear he would like to have run if the situation were different, and he would like to be president. By criticizing Clinton and speaking like a candidate, Biden made it clear that if Clinton’s campaign should implode, which remains quite possible, he is ready to serve. With multiple investigations in progress regarding Clinton’s unethical behavior as Secretary of State, it is certainly a possibility that Democrats will wake up before the convention and realize how dangerous it could be running with her heading the ticket in the general election. If Sanders is unable to defeat her, it is easy to see the math play out where the Sanders delegates and the super delegates could outnumber committed Clinton delegates and create an open convention. If the news were bad enough, it is even conceivable that some of Clinton’s delegates would rethink their support. Unfortunately the Democrats should probably change their symbol to the ostrich instead of the donkey as, other than for Sanders (until recently an independent), they seem oblivious to the trouble the party is in nation-wide. They might also take a few lessons from Justin Trudeau, as John Nichols discussed in The Nation. Seeing Biden continue to criticize Clinton today raises the question of whether he will continue to knock Clinton, hoping to increase the chances of her being forced from the race. Plus if he does prefer Sanders, would he ever openly support him over Clinton? I don’t think it is very likely Biden would openly endorse Sanders, but if he did it would be a move comparable to when Ted Kennedy endorsed Barack Obama. Both Ted Kennedy and Caroline Kennedy endorsed Obama in 2008, citing the same types of faults we continue to see in Hillary Clinton. Such a move from Biden, this time endorsing Sanders, would provide a tremendous boost to Sanders’ campaign. For now, the same media which has downplayed Sanders prospects from the start will promote the idea that Clinton is the inevitable winner. We must keep in mind that such media predictions have frequently been wrong in the past. While there is no doubt Clinton is the front runner, her nomination cannot be said to be inevitable months before a single vote has been cast. As I noted earlier in the week, the polls are not at all predictive in a nomination battle.This polling report from December 2007 described how Clinton had a huge lead over Obama. In December 2003, Howard Dean was pulling away in the polls. Eventual winner John Kerry was in sixth place with only 4 percent, even trailing Al Sharpton. This race is far from over. While the media is dwelling on the Benghazi hearings this week, and this could have a bearing at how she is perceived, the real scandals which will harm Clinton in an election campaign are not based upon this Republican witch hunt, and are not going to go away. Bernie Sanders could pull an upset, like Obama in 2008 or Kerry in 2004, or the party might yet still call on Joe Biden. Posted in Barack Obama, Bernie Sanders, Hillary Clinton, Joe Biden, John Kerry, Politics, Scandals. Tags: Barack Obama, Bernie Sanders, Hillary Clinton, Joe Biden, John Kerry, Scandals. RSS feed for comments on this post.. TrackBack URL.